Hiro (Kyoto, Japan) on 17 December 2012 in Plant & Nature. This is the last of Autumn in Kyoto seris. Thank you for your visiting. Very nice, autumn is gorgeous! Love the way the red holds the frame. A superb framing . Wonderful colors ! Red vs almost mono - very nice. Exquisite image ... Today is live on the red Aminus! Love the composition here with the autumn foliage. Nicely done, Hiro. Another beautiful composition, fantastic colors. I do not know if all the trees are red in autumn, but those of your photos are fabulous. Très beau cadrage, ce rouge est splendide. Bonne journée. And how many beautifulls have you more of the autumn ? quel rouge et iamge sueprbe compo ces couleurs ce cadrage avec les escaliers. Beautiful use of the red maples to frame this. Beautiful crimson red ~ great frame! This is nicely framed. And I am impressed at how many places you got to this autumn! Well done. @GJC: Yes, I visited so many places this autumn. Actually I took several days-off to do that. 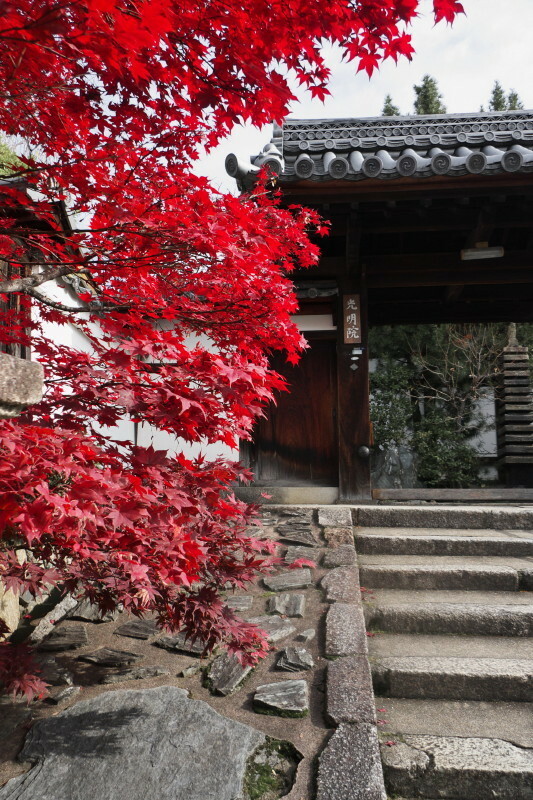 They make such a decoration, those red leaves, agaisnt the grey of the stone and the brown of wood in the gate. A very elegant contrast....subtle Kyoto!